The Bay Area is the national hub of investment, culture and innovation. This makes the Bay Area an irresistible place to visit and even more irresistible place to live. While the nationally known cities of Berkeley, San Jose, San Francisco and Oakland are talked about as must see destinations the lesser known yet equally exciting places are overlooked. Here at Apex Luxury Limousine Transportation we are proud to help you explore the lesser known corners of this beautiful, rich and lively metropolitan area. We offer all of our comprehensive luxury limo and sedan transportation services to the residents and visitors of Emeryville. Located directly on the Bay bordering Berkeley to the North and Oakland to the East and South, Emeryville boasts a stunning view of the Bay Bridge and the glistening Bay waters. It’s proximity to San Francisco, Downtown Oakland, Berkeley and North Oakland make it a gateway to the major hubs of nightlife, culture and restaurants in all of Northern California. Emeryville itself, while small, is a destination worth exploring. Bay Street is one of the East Bay’s premier shopping and restaurant destinations. Home to a plethora of high and mid range restaurants and shops make it perfect for shopping trips of any kind. Whether you need to find your spouse-to-be a wedding ring or want to buy new weekend clothes Bay Street has everything you can imagine and more. 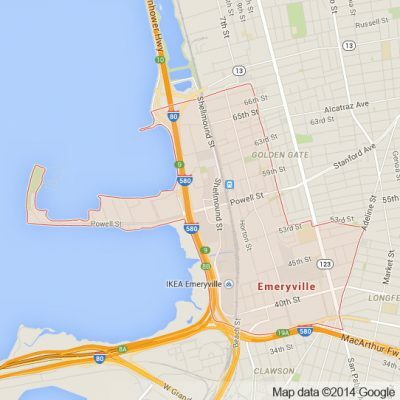 Emeryville is also home to an emergent number of creative and innovative business and corporations found nowhere else in the country. Standing out among the rest is Pixar who’s fame for making incredible animated feature length films helps put Emeryville on the map. For those looking for a relaxing day in the Bay Area sun the Emeryville Marina and the Marina Park are perfect destinations. With impeccable views of the Bay Bridge, the Emeryville Marina is one of the Bay Area’s finest destinations for an afternoon with friends underneath the sun. Apex Limousine Transportation is really proud to offer all of our limo and sedan transportation services to residents and visitors of Emeryville. For those looking for reliable limousine transportation to and from one of the Bay Area’s major airports (OAK, SFO, SJC) Apex guarantees timely pick ups and drop offs at any time of day. For those planning their wedding, Apex Limousine Transportation offers incredible wedding day services. We work very closely with the Bride, Groom and Wedding Planners to ensure that your limo transportation for your wedding day is the best it can be. We are consistently highly rated for our wedding day services. Our sedans, SUVs and limousines will perfectly compliment any wedding no matter what the size or scope. For those planning a wedding in or around Emeryville, Apex offers comprehensive transportation services. For those residing or visiting Emeryville looking to get away for a day, Apex also offers full Napa Valley Wine Tours. We can take you and your friends or family up to Northern California’s premier Wine Country any day of the week. Our vast knowledge of some of the best wineries in the world will make your Wine Country escape one you will never forget. No matter what it is you need luxury limousine transportation for Apex is here to offer professional grade services every single time. We pride ourselves on being Emeryville’s number one go to luxury limo transportation service every single time. So please join us so together we can make your dreams come true no matter what the occasion. We promise you will not regret it. Please call us for car service all inclusive total for Emeryville to/from Napa Valley transfer.